Sept. 11, 2012 - PRLog -- New York, NY –Last month, the African and American Women in Entertainment, Business & Politics For Peace Through Youth Empowerment & Cultural Chance (AAW-PEACE), a global network of women committed to accelerating the pace of economic development in Liberia, produced an invite-only inaugural benefit event at the Thompson Smyth Hotel (85 West Broadway, Tribeca NY). The prestigious kick-off was hosted by three powerful AAW-Peace stakeholders; Mona Scott-Young, President of Monami Entertainment, creator and executive producer of the hit VH1 show franchise “Love and Hip-Hop”, Barkue Tubman, owner of MBL entertainment International and AAW-PEACE founder, and Shontelle, singer and song writer at Universal Music Group. The event also featured a performance by Briana Collette, music by Afro-Electronic Dance Music creator, DJ Universe and complimentary swag bags courtesy of AAW-PEACE, Arik Air, Mirani Perfume, and Shea Moisture. The event was attended by over 150 guests, and attracted the best in the entertainment, business, health and beauty, and non-profit fields including owner of Shea Moisture/Sundial Brands, Mr. Richelieu Dennis, actress, Ms. Misa Hylton, entertainment titan, Mr. Shawn Young, Miss Black USA 2010 & founder of Joyful Joy Foundation, Ms. Osas Ighodaro. The launch was made possible by funding from Shea Moisture and the generosity of sponsors and supporters around the globe, including Arik Air, Africans in the Media & Creative Industries, Aqualife Water Liberia, I-Ella.com, DJ Universe, Liberia Love Apparel, MacDella Cooper Foundation, MBL Entertainment International, Mirani Perfume, MUI-The Public Relations Company, Monami Entertainment, National Oil Company of Liberia, and The Misa Hylton Fashion Academy. “AAW-PEACE is proud to pool together business leaders from the Diaspora and beyond, committed to social philanthropy, economic, and social development for Africa. We are happy that our launch event in New York City was successful because it shed light on our efforts to empower disenfranchised youths, and is already building momentum for our Dare to Dream Conference in December”, said AAW-PEACE founder, Barkue Tubman. 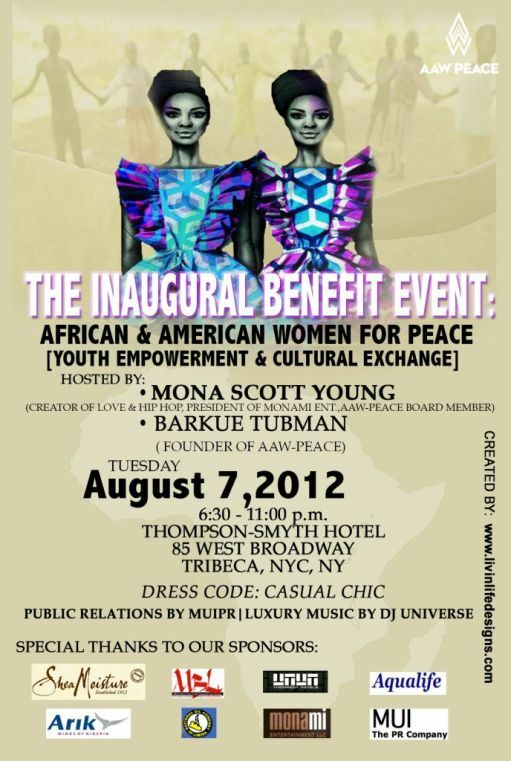 Visit AAW-PEACE today to donate to its youth empowerment efforts. For press information and for the most up-to-date, insider information about AAW-PEACE in the USA, please contact MUI – The Public Relations Company at info@muipr.com or follow MUIPR on twitter @muipr. The African & American Women for Peace, Youth Empowerment and Cultural Exchange Network (AAW-Peace) is a global network of well-meaning women, committed to accelerating the pace of socio-economic development in Liberia, through the implementation of youth-focused programs in entrepreneurship, education, media, arts and culture.